Little Ellie Farmer is yet to learn how to walk but this hasn’t stopped the toddler from scaling a climbing wall! 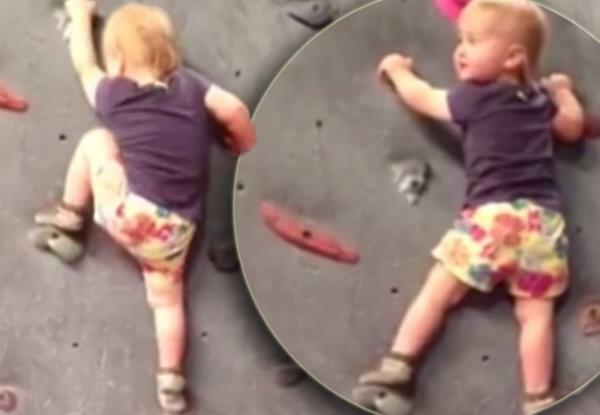 The 20-month-old, from Flagstaff, Arizona, appears to be following in her parents Rachael and Zak Farmer’s footsteps- the two are competitive climbers. In a video shared online, the toddler can be seen pulling herself up climbing walls and looking down proudly at her parents. “She’s really been part of the climbing community since birth,” revealed Zac. “I kind of imagined when I had Ellie that she was going to be this calm baby, and we’d always go hiking in the woods, and she’d watch the butterflies go by. Because Ellie is too small to fit in a harness, she wears soft-soled leather shoes to protect her feet, and her parents are always on stand-by to stop her falling.